The rafters of Reed Green Coliseum of University of Southern Mississippi in Hattiesburg thundered as more than 2,100 students, staff, volunteers, and guests enthusiastically greeted the opening session of Momentum, formerly known as Brethren National Youth Conference. The Saturday night, July 21 session began with recognition of the 70th year of the conference. The first conference was held in 1938 when 102 teens gathered at Camp Bethany in Winona Lake, Ind. 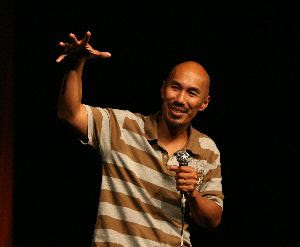 Last night in Hattiesburg, Francis Chan (pictured at at right), teaching pastor at Cornerstone Community Church in Simi Valley, Calif., challenged the audience to follow the teachings of the Bible. Speaking from II Corinthians 5:15-17, he said that Christians should live as new creations. “If I really believe this, my life should look a lot different,” he said. He likened repentance to being on a crowded escalator. He also spoke of the sacrifice of following Christ. He noted that Jesus never begged people to follow him. The evening also featured heart pounding music from Atlanta-based musician Steve Fee, a testimony from Olympic bobsledder Brock Kreitzburg, and an opportunity to pray with others in the auditorium. Dan O’Deens, pastor of Gateway Grace Community Church in Parkesburg, Pa., introduced Jeff Swaim from Convoy of Hope. The organization has partnered with Momentum to provide funds for groceries and other services during rebuilding ministry projects this week. More than 500 students each day will travel to Gulfport and Pearlington, Ms. to assist with rebuilding efforts. Also at the session, coordinators for the projects were introduced. More than 50 people from around the country have volunteered their time to supervise teams at 13 sites in Gulfport. In Pearlington, it is anticipated that Momentum volunteers will build 17 homes. Chan leads off first full day of the conference on Sunday when he challenges conference attendees to live life authentically during the morning session, a theme he’ll also address in the evening session. In the morning students may choose from more than 40 practical “Sponge Sessions” where they can learn about anything from spiritual warfare and powerful prayer, to materialism and purity. Afternoon options include a sports tournament, NAC (Nurturing Abilities for Christ) competition, quizzing, and off campus opportunities. The conference continues through Friday, July 27. To view photos and news from Saturday’s events, click here.